Having decided to try dressage riding, what dressage tack and equipment will you need? But when starting out you can make do with basic riding tack or if you’re really serious, choose to invest in some specific dressage tack. This is compulsory at lower dressage competition levels. Plain black is necessary for affiliated competitions but brown or black would be acceptable at unaffiliated competitions. Definitely, don’t try riding in that pretty pink webbing bridle you got for Christmas from your well-meaning relative. To begin with, you don’t need a specialist dressage saddle as a general purpose saddle will do fine. You may find a jumping saddle uncomfortable for dressage, as your leg needs to be longer and straighter, and your position not so far forward. As you progress through the levels a proper well fitted dressage saddle, which is cut longer and straighter will be an essential purchase. Good quality secondhand saddles are readily available, but if you have the budget always try to use a dressage saddle that’s been fitted to both you and your horse. 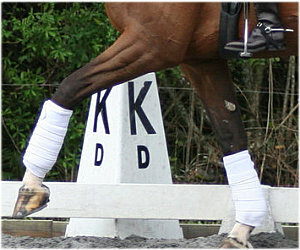 Boots and bandages are allowed in the working-in area at a dressage competition, but must be removed before you enter the dressage arena. Dressage is always about painting that perfect picture, so try to use boots or bandages that compliment your horse and your own appearance. Bulky boots with half undone velcro straps flapping about when your horse moves, isn’t a good look. And there are usually specific dressage association rules governing how the dressage rider should be dressed during the dressage test. Make sure you know the rules or dressage attire guidelines for your association.